This entry was posted on June 6, 2017 by Nick. 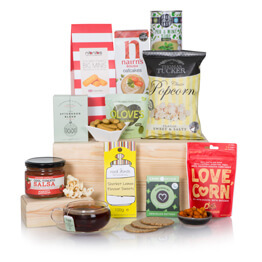 Whatever the special occasion, whether it be a birthday, Father’s Day or a wedding, Hamper.com has a fantastic collection of hampers for him and her. 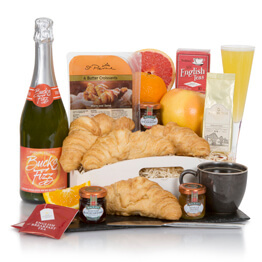 Each gift is beautifully presented and is packed with a delicious selection of food and drink. 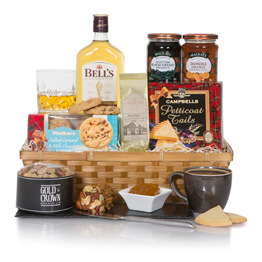 Discover our range of hampers for him and her and take advantage of our free UK next day delivery. 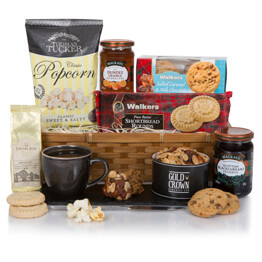 Hamper.com has a wonderful collection of hampers for men that are filled with the finest treats. With Father’s Day on the horizon, these gifts are perfect for dads, stepdads or grandads. If you can’t find the right gift for him below, then browse the full collection of Father’s Day gift hampers. 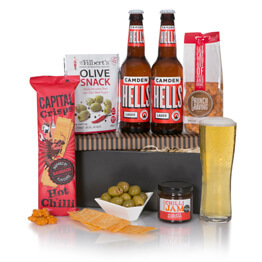 Perfect for a lover of all things spicy, this gift features Stella Artois beer, chilli jam and a selection of hot and spicy snacks. Whether it’s his birthday or just as a special treat, he’ll absolutely love the Hot Stuff Beer Gift. 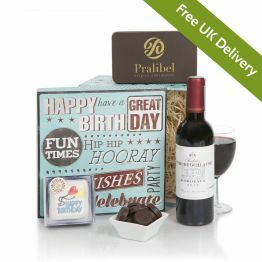 Celebrate his birthday with this fantastic gift box, filled with a delicious birthday cake and indulgent red wine. Beautifully presented, this is just one of the many birthday gifts that Hamper.com has available. Treat him with the Birthday Gift Box Hamper for Him. A fantastic alternative to traditional favourites, he’ll love the assortment of real ales in this wonderful hamper. 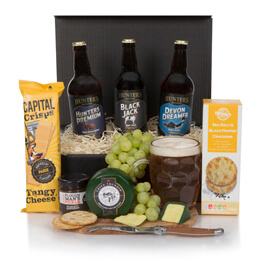 Accompanied by delicious cheese and pickle, he’ll love the Real Ale Hamper for Him. For the full range of presents specifically created for men, browse the full range of hampers for him. Browse the full collection of hampers for her to find the perfect present for your mum, wife, sister or friend. 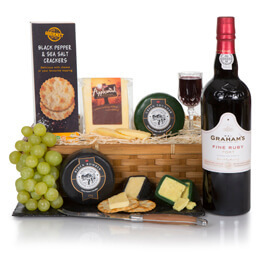 Whatever the occasion, discover our wonderful and thoughtful range of hampers for her. Celebrate her birthday with this fantastic alcohol-free hamper. Featuring chocolate dipping sauce, amaretto flutes, birthday chocolate and fluffy marshmallows, she’ll love this wonderful gift on her special day. Buy online today and take advantage of free next day UK delivery on the Birthday Tower For Her. She’ll love the Cortefresca Pinot Grigio Blush wine that’s included in this fantastic gift. 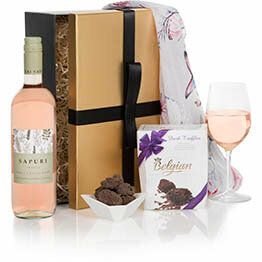 The fruity rose wine is accompanied by delicious chocolate truffle and a beautiful floral scarf. Perfect for any occasion, choose the Ladies Delight gift for her next special occasion. This gift is the perfect way to show her how grateful you are! 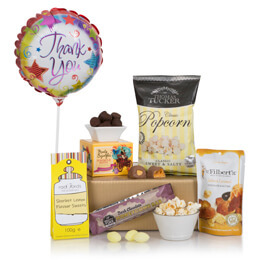 Featuring delicious thank you chocolates, breakfast tea and a useful red jute bag, she’ll absolutely love the Thank You For Everything! Hamper.com providers free next day delivery on all gift hampers in the UK, ensuring your present reaches your loved one in time for the special day. If you live in a different country, then you can find out more about our worldwide delivery service.